My first original free crochet pattern! I hope you enjoy the Arrowhead Leaf. At the bottom of the page there is a button that will let you download a PDF of the pattern. At the end of all rounds, join with sl st under previous chain 1 and pull tight, then loosen loop a bit before ch 1. The first sc of each round then goes into the first sc. Loosening the loop makes it easier to locate the chain 1 for the join. “Inc” means 2 sc in one stitch. At the end there are two variations with borders for crab stitch or a softer slightly wavy border. Chain 1, 21 sc in ring. Join, chain 1. 2 sc, ch 5, skip 2, 6 sc. In next sc, (1 sc, ch 4, 1 sc). 6 sc, ch 5, skip 2, 2 sc. 1 sc in back loop, inc in back loop. 7 sc in ch-5 space. 7 sc in back loops. 7 sc into ch-5 space. Inc in back loop of next sc, sc in back loop of last sc. 2 sc, inc, 8 sc, inc, 7 sc. 7 sc, inc, 8 sc, inc, 2 sc. In back loops, 3 sc, inc. Ch 2. [Skip 1, dc in both loops, ch 2] 5 times. Skip 1. [ch 2, skip 1, dc in both loops] 5 times. Ch 2, skip 1. In back loops: Inc, 3sc. In back loops, 4 sc, inc.
[sc 2 in ch-2 space, sc in both loops of dc] 5 times. 2 sc in last ch-2 space. In back loops, 5 sc, inc, 5 sc. [2 sc in ch-2 space, sc in both loops of dc] 5 times. In back loops, inc, sc 4. In back loops, 37 sc. In ch-4 loop, 2 sc, ch 3, slip stitch into bottom chain, 2 sc. If you do not want a stem, join. Finish off and weave in ends. If you do want a stem, do not join. Ch 10 (or what you need for length you want), sl st in 2nd ch from hook and all the way back to body of leaf, sl st in first sc of round. In Round 7, use ch-4 pattern in ch-4 loop. And end of Round 7, do not join. Crab stitch around right side of leaf to ch-4 space. Crab stitch around left side of leaf through first st of round 7. If you do not want a stem, turn and sl st through first crab stitch. Finish off and weave in ends. If you do want a stem, turn and ch 10 (or what you need for length you want), sl st in 2nd ch from hook and all the way back to body of leaf, sl st in through first crab stitch of round. In Round 7, use ch-4 pattern in ch-4 loop. At end of Round 7, join. Sl st, ch 1 down the side of the leaf to the ch-4 space. Sl st, ch 1 up the other side of the leaf. Light blue = DMC Petra Size 5 with 2mm steel crochet hook. Forest Green = Aunt Lydia’s Crochet Thread Size 10 with D (3.25mm) aluminum hook. Red = Aunt Lydia’s Crochet Thread Size 5 (from Knitting Warehouse) with aluminum C hook (2.75mm). Turquoise: DMC Petra Size 5 with Kreinik Blending Filament 014 (Turquoise) and 2mm steel hook. White = BambooMN Yarn & Socks Cotton in Icicle with D hook and crab stitch border. The steel crochet hooks I use are from The Crochet Dude (plus a few I inherited from my grandmother). I have collected various sizes of aluminum crochet hooks over time. 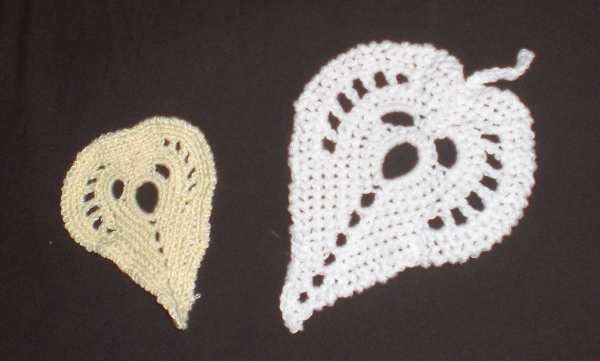 To watch for more free crochet patterns by me in the future, please subscribe to this blog. I have thoroughly tested this pattern, but if you have any questions or feel there is any error, please post a comment. This free crochet pattern is © 2016 by Marcia Purse. 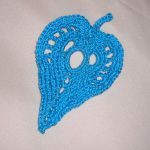 You are free to sell items made from this pattern, but you may not reproduce the pattern on any website or claim ownership. If you do sell items, you must include “Pattern by Echo’s Web” in the description. 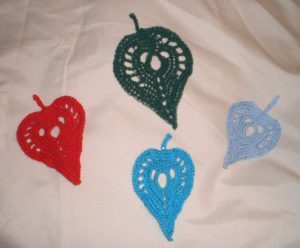 Items sold online may not include images from this site, but if you wish to link to the pattern, you may use my images. This entry was posted in Crochet and Crafts by Echo. Bookmark the permalink.